Volunteer driversTerry Lacey and Dennielle Rowley were recently honoured at a provincial awards ceremony (hosted by the Ministry of Citizenship and Culture) for their 5 years of volunteer service to Family & Children’s Services of St. Thomas and Elgin. 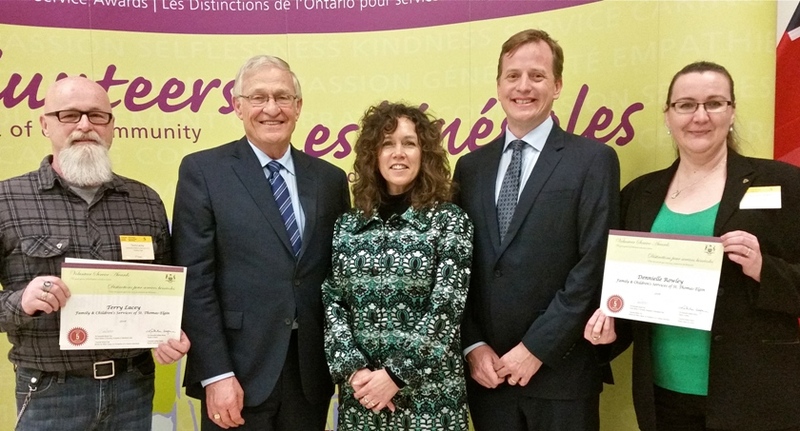 Presenting this esteemed award was Oxford MPP Ernie Hardeman and Elgin-London-Middlesex MPP Jeff Yurek. 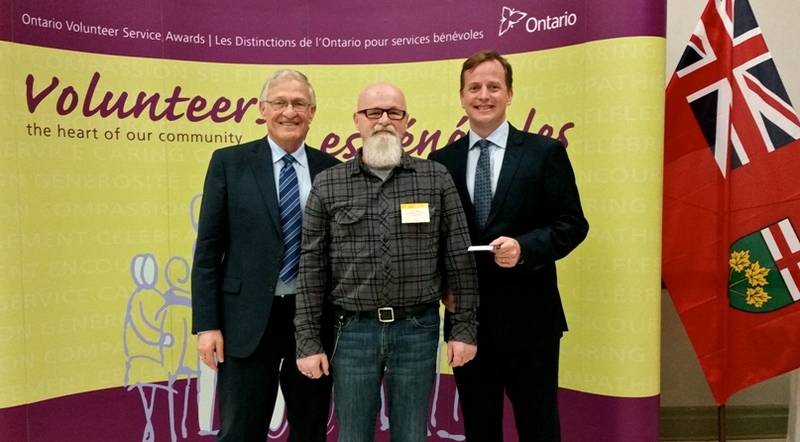 Both Terry and Dennielle received a trillium lapel pin and personalized certificates in recognition of their commitment and dedication as Ontario volunteers. 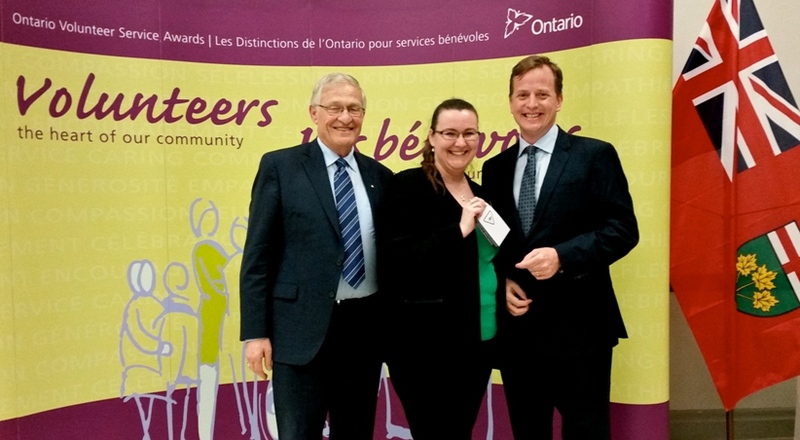 Also in receipt of 2016 Ontario Volunteer Service Awards were program volunteers Michaela Willsey and Gail Ford, as well as board volunteer Sandra DiMeo. Congratulations to all!! A very proud moment indeed! I remember when Gary first started driving for the Moms and Tots program. The little ones would wait for him to arrive and then run to him with open arms yelling “My Gary, My Gary!! 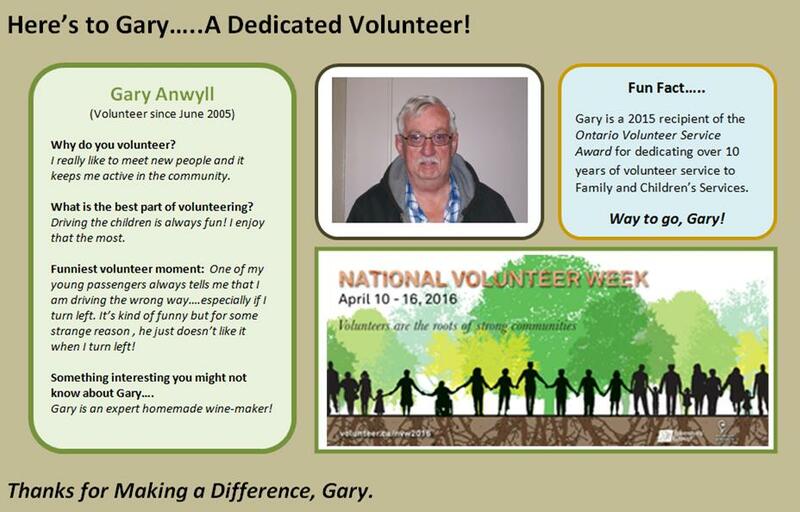 !” From babies to preschoolers, they all wanted us to know how important Gary was when he arrived. I still look forward to seeing him from time to time at 99 as he continues to serve our community as a volunteer. Thanks Gary! 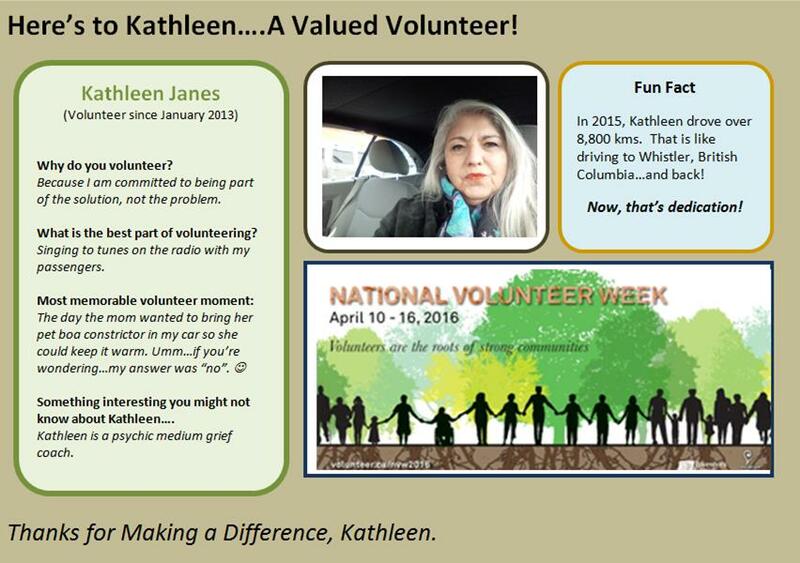 I’ve been in a few trainings with Kathleen and she is so invested in learning and takes her job as a volunteer driver very seriously. She really cares about the kids and wants to do the best she can with them for the short time she has them in her car. I first met Bob when he volunteered to help a lad of ours with math. Bob was such a gentle advocate and wonderful male role model. After that it’s been bikes! bikes! bikes! It is Bob and his bike buddies that have inspired me to start developing the bike repair workshop at the Hub. When the “Bob Fan Club” is established one day, I will be the president. 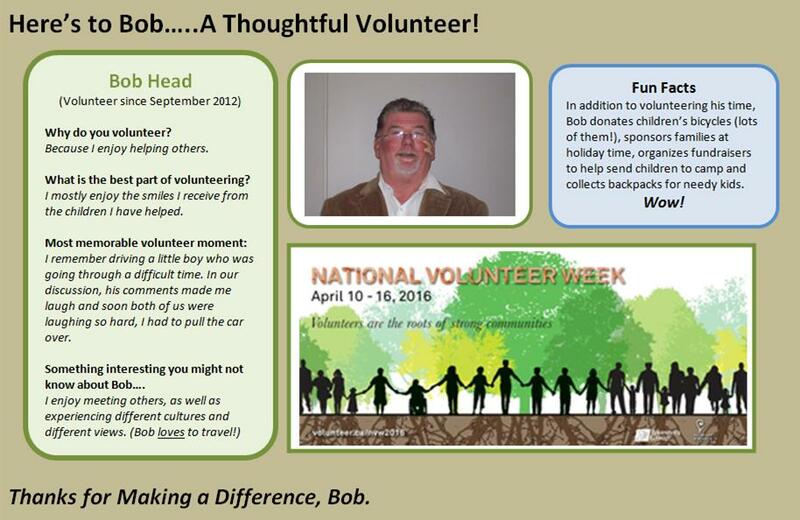 Thanks Bob, for all you do and how you do it! Lynn has such a great rapport with youth. She is a good listener, caring and doesn’t judge them. She always has their best interests at heart. 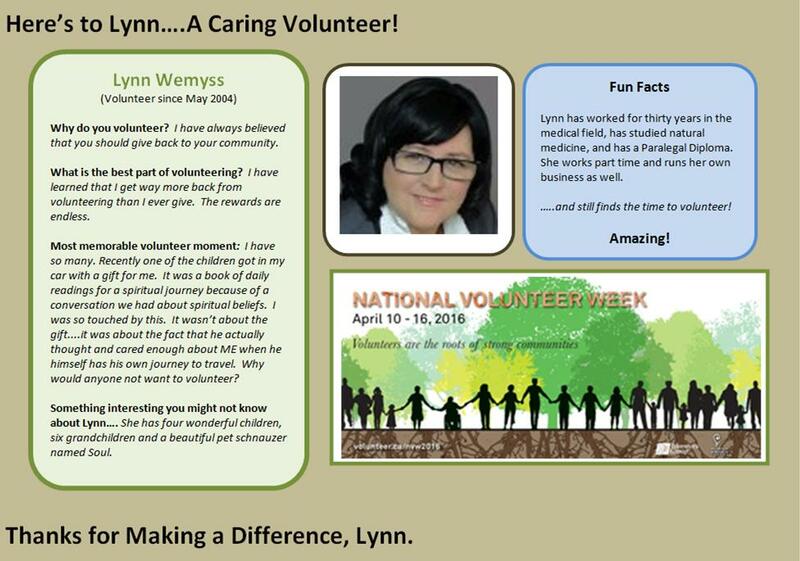 Thanks Lynn!